State Road 79 provides one of three corridors linking Interstate 10 and Lower Alabama with coastal Bay County and Panama City Beach. Beginning at Front Beach Road (SR 30), SR 79 (Arnold Road) initially follows a two-lane street linking Edgewater Beach with Panama City Beach City Hall and U.S. 98 (Panama City Parkway). The highway expands into a four-lane, divided arterial and continues northward to the B.V. Buchanan Bridge across the Intracoastal Waterway at West Bay. The rural highway passes west of Northwest Florida Beaches Airport en route to Seminole Hills and Pine Log State Forest. Crossing Pine Log Creek 14.348 miles north of Front Beach Road, SR 79 enters Washington County and the rural town of Ebro. SR 79 meets SR 20 in Ebro, which is best known for its Greyhound Park. North from there, the state road gradually shifts eastward, traveling through the settlements of Red Head and New Hope ahead of Vernon. Florida 79 follows Main Street through the Vernon city center, crossing Holmes Creek north of Florida 277. Florida 277 branches northeast to Chipley, while Florida 79 resumes a northerly course to Bonifay in Holmes County. The state road travels 28.671 miles in Washington County. Continuing toward the Alabama state line, Florida 79 links with I-10, U.S. 90 and SR 2 along a 17.674-mile course across Holmes County. Florida 79 becomes Alabama 167 north from the rural town of Esto. Phase A - 4.5 miles from Mill Branch Bridge to Reedy Branch Road, constructed with a rural four-lane design with a grassy median, and an urban design from south of New Hope to Reedy Branch Bridge. Phase B - 3.2 miles from Pate Pond Road to Cypress Creek Bridge. Work included a new bridge over Cypress Creek and expanded SR 79 with rural four-lane design standards. Phase C - 6.0 miles from Cypress Creek Bridge to Intestate 10. SR 79 was built with rural design standards and a new span was constructed over Open Creek. Phase C - 6.4 miles from Reedy Branch Bridge to Court Street in the city of Vernon. SR 79 was built with rural design standards north to Cook Circle, and as an urban style arterial between Court Street and Cook Circle. Traffic lights were added at Sapp Street. Work on the 20.085-mile long expansion through Washington County wraps up in winter 2019. The design-build project cost $96.788 million. Southward view of the B.V. Buchanan Bridges from a segment of Old Highway 79. Provisions were built into the 2008-crossing to accommodate future expansion of SR 79. Photo taken 06/12/09. A portion of the original SR 79 ICWW bridge remains below the two fixed spans of the B.V. Buchanan Bridge. The northbound span is slightly shorter than its 2,700-foot long predecessor. Photo taken 06/12/09. The two legs of the wye intersection joining SR 30 (Front Beach Road) with SR 79 (South Arnold Road) northbound come together ahead of the first confirming marker. Photo taken 01/16/16. North from Panama City Beach, SR 79 travels five miles to West Bay and 46 miles to the Holmes County seat of Bonifay. Photo taken 06/19/11. The two-lane section of SR 79 along Arnold Road leads 0.531 miles north to U.S. 98 (Panama City Beach Parkway). Photo taken 06/19/11. U.S. 98 travels across the Emerald Coast east to Panama City and west to Sandestin, Destin, and Pensacola. Photo taken 01/16/16. Panama City Beach Parkway (Back Beach Road) is a four to six lane arterial, generally with commercial frontage. U.S. 98 heads eight miles east to a short freeway linking with the Hathaway Bridge across St. Andrews Bay. Photo taken 06/19/11. Confirming marker for SR 79 north, posted on the 0.9-mile drive from U.S. 98 to Bay Parkway. Photo taken 10/13/16. Transitioning into a rural highway, Florida 79 advances north from Panama City Beach to West Bay. Bonifay remains 46 miles to the north, as this mileage sign stands just 0.7 miles north of the previous assembly. Photo taken 10/13/16. The speed limit previously increased to 65 miles per hour as SR 79 departed from Panama City Beach. A new traffic light was activated along this stretch at Bay Parkway on May 5, 2017.5 Formerly known as the Loop Road, Bay Parkway is 1.5-mile long arterial bypass linking SR 79 with Pier Park Drive south to U.S. 98. A $3.5 million contract for the project was approved by Panama City Beach City Council in January 2016.6 Photo taken 10/13/16. Further construction anticipated for 2019 will extend Bay Parkway east from Pier Park Drive to Nautilus Street. An agreement on March 20, 2018 between the Bay County Commission and Panama City Beach officials provided $3.5 million in funds for the project6 St. Joe Co. development plans in 2017 will add potentially 350 residential units along Bay Parkway at Pier Park Drive. Photo taken 10/13/16. The community of West Bay lies along SR 79 at the Gulf Intracoastal Waterway, just off West Bay. Side Camp Road east and School Lane west intersect the state road here. Photo taken 10/13/16. SR 79 proceeds one mile north across the Intracoastal Waterway to SR 388 east for Northwest Florida Beaches International Airport (ECP). Photo taken 10/13/16. Reassurance marker preceding the B.V. Buchanan Bridge taking SR 79 over the Intracoastal Waterway. Photo taken 10/13/16. The B.V. Buchanan Bridge was twinned during four-lane expansion of SR 79 between 2007 and 2009. The southbound span dates back to 1993. Photo taken 06/19/11. Second photo taken 10/13/16. Third photo taken 10/13/16. With increased traffic headed to Northwest Florida Beaches International Airport (ECP), and eventual four-lane expansion of SR 388, signals were installed at SR 79 and SR 388 in 2012. Photo taken 10/13/16. The passenger terminal for ECP Airport lies 6.5 miles to the northeast via SR 388 and West Bay Parkway. Commercial flights at the airport began on May 22, 2010. Photo taken 10/13/16. Bay County Road 388 east to SR 77 was upgraded to State Road 388 in July 2013. 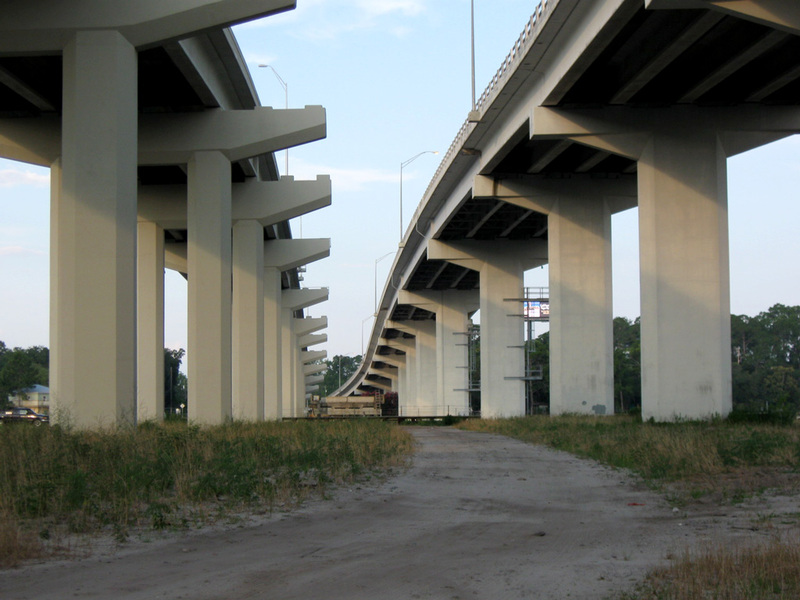 The FDOT transfer allowed plans to proceed on four-laning the entire 12.3 mile highway. Photo taken 10/13/16. The town of Ebro is the next population center along SR 79, located ten miles north of West Bay. Photo taken 06/19/11. Widening of SR 388 anticipated for construction in 2020 includes building a new terrain alignment for the four-lane highway, from West Bay Parkway to a point 1.25 miles north of the current intersection with SR 79. Photo taken 06/19/11. A handful of residential streets tie into SR 79 ahead of Steel Field Road and this reassurance marker. The four-lane highway briefly switches to urban design with curbing and sidewalks through the rural community. Photo taken 06/19/11. Northbound SR 79 enters Pine Log State Forest ahead of CR 2296 (Pine Log Road). Photo taken 06/19/11. CR 2296 (Pine Log Road) navigates westward 4.43 miles through timberland, much of which is owned by the St. Joe Land & Development Company, to Otter Creek Bridge Road. Photo taken 06/19/11. Continuing north from CR 2296, SR 79 traverses areas of Pine Log State Forest through the Seminole Hills area. Photo taken 06/19/11. Winding through an S-curve across Pine Log Creek, Florida 79 crosses the Washington County line. Photo taken 06/19/11. Advancing 1.75 miles north from the county line, Florida 79 intersects Florida 20 in the town of Ebro. Photo taken 06/19/11. Northbound SR 79 at SR 20 west to Bruce (SR 81) and east to Clarksville (SR 73). The western stand alone section of SR 20 extends 147 miles overall from Niceville and east to Tallahassee. The state road overlays U.S. 27 east from Tallahassee to High Springs. Photo taken 06/19/11. Heading south from SR 20 along SR 79 within the town of Ebro. The municipal complex lies along the east side of the state road here. Photo taken 08/03/08. The unincorporated community of West Bay is a ten mile drive south from Ebro. Florida 79 ends in Panama City Beach. Photo taken 08/03/08. SR 79 spans Pine Log Creek into Bay County. A new northbound bridge for SR 79 was construction during four-lane expansion in 2008. Photo taken 08/03/08. Four-laning of SR 79 south from Pine Log State Forest added a new southbound roadway and rebuild the existing roadway for northbound traffic. The state road intersects CR 2296 (Pine Log Road) west near Seminole Hills. Photo taken 08/03/08. County Road 2296 (Pine Log Road) spurs 4.43 miles west to Otter Creek Bridge Road. Photo taken 08/03/08. Steelfield Road meets Florida 79 at Woodville, south of the 2008-widening project. Steelfield Road stems west to the Bay County Solid Waste landfill and Point Washington Wildlife Management Area. Photo taken 08/03/08. Florida 79 south enters West Bay ahead of Florida 388 east to Northwest Florida Beaches International Airport (ECP) and the B.V. Buchanan Bridge across the Intracoastal Waterway. Photo taken 08/03/08. CR 388 was transferred to state maintenance in July 2013 and reassigned as SR 388. The state road skims northern reaches of West Bay east 12.3 miles to SR 77 at Vicksburg. Photo taken 08/03/08. The fixed, high-level span across the Gulf Intracoastal Waterway, and the adjacent park and boat ramp below, honor B.V. Buchanan. Buchanan was Bay County Commissioner between 1953-55. Photo taken 08/03/08. 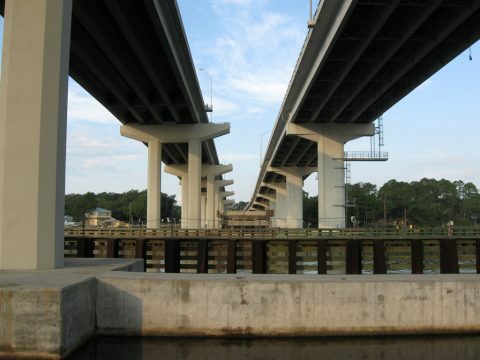 Completed in 1993, the southbound span across the Gulf Intracoastal Waterway carried two-way traffic until November 2008, when the companion span open for northbound SR 79. Photo taken 08/03/08. School Drive and Side Camp Road intersect Florida 79 south of the B.V. Buchanan Bridge at West Bay. Photo taken 08/03/08. Speed limits resume at 65 miles per hour along SR 79 south from School Drive to the Panama City Beach line. Photo taken 08/03/08. FDOT recorded 13,800 vehicles per day (vpd) along SR 79 south between School Drive and U.S. 98 in Panama City Beach in 2017. Photo taken 08/03/08. Approaching U.S. 98 (Panama City Beach Parkway) on Florida 79 (Arnold Road) south. U.S. 98, previously known as Back Beach Road, comprises a heavily traveled six-lane arterial throughout Panama City Beach and unincorporated areas to the west. Photo taken 10/16/11. Panama City Beach Parkway was originally built as a bypass for U.S. 98 around coastal areas of Bay County. The US highway travels along the Emerald Coast from Panama City west to Sandestin, Destin, Fort Walton Beach and Gulf Breeze. Photo taken 08/03/08. Florida 79 (South Arnold Road) reduces to two overall lanes between U.S. 98 and Florida 30 (Front Beach Road). Photo taken 10/16/11. SR 79 proceeds 0.4 miles south from U.S. 98 to separate at a wye-intersection for SR 30 (Front Beach Road). Photo taken 10/16/11. Traffic partitions for SR 30 (Front Beach Road) west to Laguna Beach, Santa Monica and Sunnyside and east through the heart of Panama City Beach. SR 30 is a discontinuous route, with county and city maintained sections. Photo taken 10/16/11. Following the eastern leg of the wye intersection along SR 79 at SR 30 (Front Beach Road) and Edgewater Beach. Photo taken 10/16/11. State Road 79 - Phase D - Public Information Meeting handout. Florida Department of Transportation (District 3). "West Bay bridge complete." News Herald, The (Panama City, FL), November 28, 2008. "On the open road: State 79 widening project shifting lanes." News Herald, The (Panama City, FL), June 19, 2008. "Improvements coming to West Bay bridge corridor." News Herald, The (Panama City, FL), September 11, 2012. "New Traffic Signal at SR79 & Bay Pkwy Activation." WMBB (Panama City Beach, FL), May 4, 2017. "City council names "Loop Road" concept as "Bay Parkway"." WJHG TV-7 (Panama City Beach, FL), May 12, 2016. "The road eventually might be extended even farther eastward, perhaps to Cauley Avenue" News Herald, The (Panama City, FL), March 20, 2018.